Integrated superconducting submm receivers and spectrometers. Technology for fabrication of superconducting integrated circuits based on high quality submicron Nb and NbN tunnel junctions with high current density. Development, study and optimization of the superconducting phase locked Local Oscillator for integrated spectrometer. Design, fabrication and experimental studies of a novel device: Cold Electron Bolometer (CEB). Development of the superconducting elements for operation at frequencies up to 1 THz. Superconducting Integrated Submm Spectrometer for Laboratory Applications. M.A.Tarasov, V.Yu.Belitsky, G.V.Prokopenko, “DC SQUID RF amplifiers”, IEEE Trans. Appl. Supercond., v.2, N 2, (1992), pp. 79-83. M.Tarasov; V.Belitsky; G.Prokopenko; L.Filippenko; V.Koshelets, “DC SQUID RF amplifier with external mm-wave pumping and its testing by SIS junction noise”, Superconductor Science & Technology, vol.4, no.11; Nov. 1991; p.644-646. M.Tarasov, Z.Ivanov, “Optimization of input impedance and mechanism of noise suppression in a dc SQUID RF amplifier”, IEEE Trans. Appl. Supercond., v.6, N 2, June 1996, pp. 81-86. M.Tarasov; G.Prokopenko; V.Koshelets; I.Lapitskaya; L.Filippenko, “Integrated rf amplifier based on dc SQUID”, IEEE Transactions on Applied Superconductivity, vol. 5, no.2, pt.3; June 1995; p.3226-3229. M.Tarasov, A.Vystavkin, L.Filippenko, “Performance margins and application area of SQUID amplifiers”, 25 European Microwave Conf., Bologna, Italy, 4-8 Sept. 1995, pp. 1118-1122. M.Tarasov, L.Filippenko, A.Baryshev, A.Vystavkin, T.de Graauw, W.Luinge, “Experimental studies of SQUID amplifier at 1 GHz with SIS mixer as a source of signal”, EUCAS’95, 3-6 July 1995, Edinburgh, Scotland., pp. 763-768. A.Kalaboukhov, M.Tarasov, A.Lohmus, Z.Ivanov, O.Snigirev, Properties of a high-Tc dc SQUID radiofrequency amplifier, IEEE Trans. Appl. Supercond., VOL. 13, No 2, 2003, pp. 1039-1041. 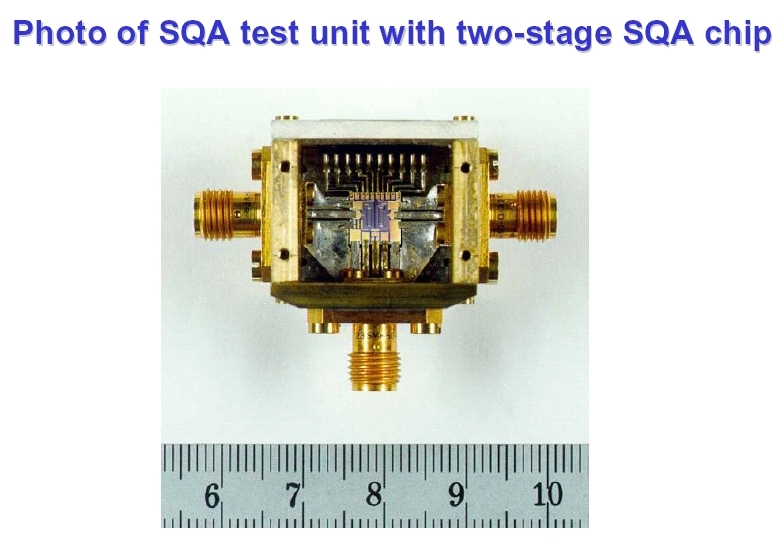 M.Tarasov, A.Kalabukhov, O.Snigirev, E.Stepantsov, Z.Ivanov, O.Mukhanov, “Radio frequency amplifier based on high temperature superconducting dc SQUID”, Proc. 85th Int. Supercond. Electronics Conf., June 19-22, 2001 Osaka, Japan, pp. 149-150. G. V. Prokopenko, S. V. Shitov, D. V. Balashov, V. P. Koshelets, and J. Mygind, "Low-noise S-band DC SQUID Amplifier", presented at EUCAS'99, report 6-80, Barcelona, September (1999). G. V. Prokopenko, D. V. Balashov, S. V. Shitov, V. P. Koshelets, and J. Mygind, "Two-stage S-Band DC SQUID Amplifier". Was presented at ASC-98, Palm Desert , CA , USA , Report EAC-02 (1998), IEEE Trans. on Appl. Supercond. 9, 2902–2905 (1999). G.V. Prokopenko, S.V. Shitov, D.V. Balashov, P.N. Dmitriev, V.P. Koshelets and J. Mygind, “Low-noise S-band DC SQUID Amplifier”, Applied Superconductivity Conference ASC’2000, September (2000), Report 5EH04, IEEE Trans. on Appl. Supercond., v.11, No 1, pp. 1239-1242, (2001). G.V. Prokopenko, S.V. Shitov, I.L. Lapitskaya, V.P. 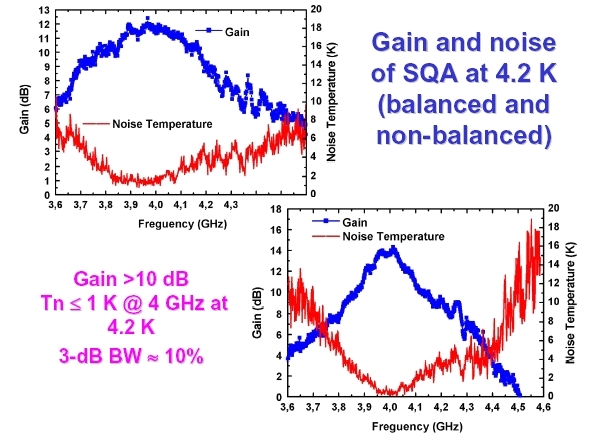 Koshelets and J. Mygind, “Dynamic Characteristics of S-band DC SQUID Amplifier”, “IEEE Trans. on Appl. Supercond.”, vol. 13, No 2, pp. 1042-1045, June 2003. M.Tarasov, A.Kalabukhov, S.Gudoshnikov, H.Seppa, M.Kiviranta, L.Kuzmin, “Towards a SQUID readout for the normal metal hot-electron microbolometer”, Physica C, 368 (2002), 161-165. M.Tarasov, A.Kalabukhov, S.Kovtonjuk, I.Lapitskaya, S.Gudoshnikov, M.Kiviranta, O.Snigirev, L.Kuzmin, H.Seppa, Femtoamperemeter based on superconducting quantum interferometer and bulk transformer, J. of Communications Technol. And Electronics, Vol. 48, No 12 (2003), pp. 1521-1526.- file in txt format (14 kB).